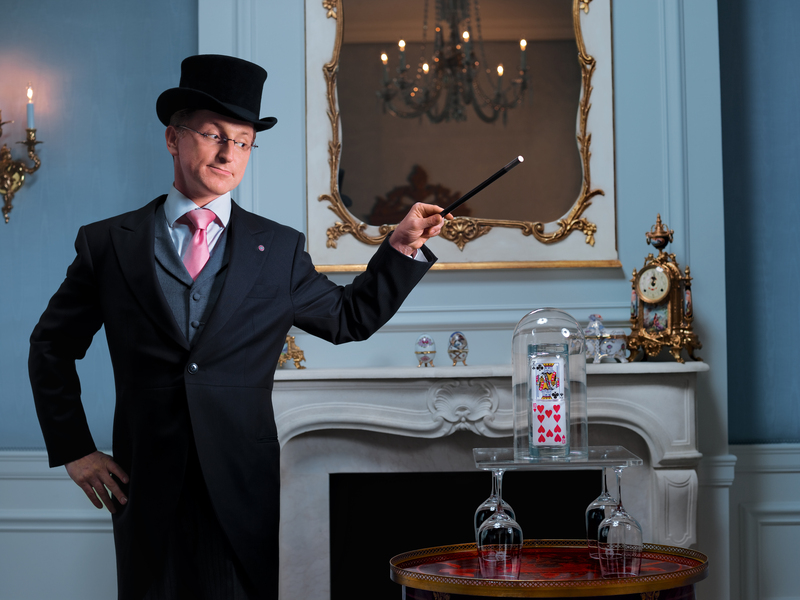 Steve Cohen, also known as the Millionaires’ Magician, has performed his show at the Waldorf Towers 3,000 times — for 250,000 people. A cluster of of well-to-do couples huddle in the lobby of the Waldorf Towers in New York City, buzzing with anticipation. At the stroke of 8:45 p.m. on Saturday evening, a tall man in a tailored suit ushers everyone into a gold-plated elevator – the same one that the President of the United States rides when he stays in New York. Primping and fidgeting, the group lines up at a suite at the end of a hallway on the 35th floor. 58 people file in for tonight’s magic show in Steve Cohen’s living room, run solely by word-of-mouth. Cohen’s “Chamber Magic” shows inspire an intimate, old-timey parlor feel. Attendees, many of whom have purchased tickets months in advance, are expected to dress well. 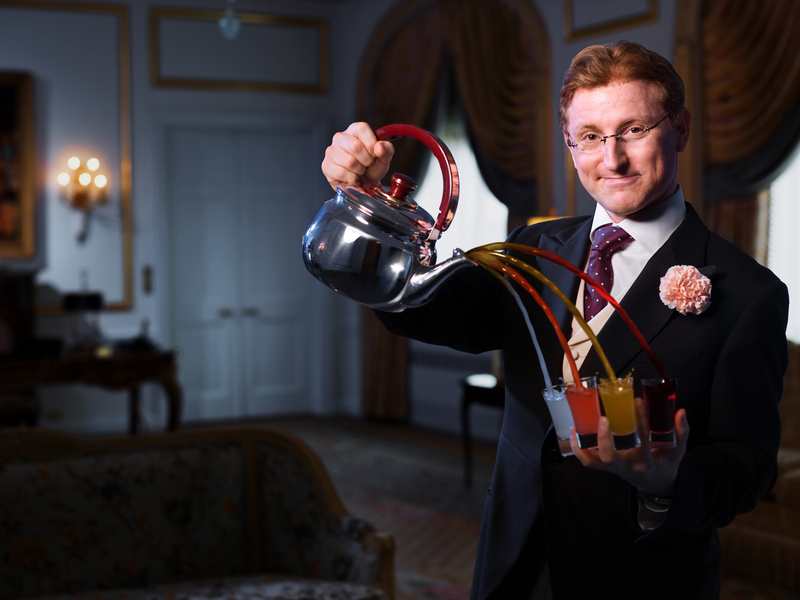 He doesn’t bother with hats, rabbits, or sleight-of-hand tricks; instead, he uses one gleaming tea kettle to produce five different drinks at the audience’s request. Previous jobs: After graduating from Cornell, I stayed in Tokyo for five years as an English translator. It involved sitting at a desk with lots of legal work and patents. That seems like a pretty far stretch from your current line of work. The translation work was terribly boring, but lucrative. I was eager to do magic, so I got some part-time jobs performing in hotels, and those got more and more lucrative. I came back to New York and started from scratch as a consultant for other magicians. Then, I started doing my own shows. Who – or what – brought you into the world of magic? My uncle. He was very talented with cards, and taught me the fundamentals of card magic that you need to become a good magician. I spent all my times at family parties with him. He gave me a book called Magic With Cards, a book from the 1890s that is very hard to find. How did you turn a childhood hobby into a multimillion-dollar business? For two years, after moving back to America from Japan, I lied to my wife and told her we were breaking even. But we were losing money every show; I lost about $200,000 of my own money. I was about to throw in the towel when an editor from DailyCandy.com came to review the show. Overnight, the show sold out for a year in advance. Then CBS Sunday Morning did a segment on me, and by the end of the week, I had sold $1 million worth of tickets. I had to add more shows. Is the Waldorf your permanent home? I stay here on weekends. I have another apartment on the Upper West Side with my family – my wife and two kids, ages 12 and 8 – during the week. Do your kids love magic? They each practice one trick each year, and on Father’s Day, they perform it at my show. But my daughter is more into it than my son. She’s a ham. But there’s not that many women in magic, if you think about it. Why do you think more men than women are into magic? I’m not sure. But I don’t really recommend becoming a magician to anyone. People are constantly making gags about it. Imagine going into your child’s school for a parent-teacher conference, and the teacher says, “Your child seems to think you’re a magician of some sort.” You always have to explain what you do. In your grand finale, two audience members shuffle two separate decks of cards. Then, you reveal that each card in the first deck falls in the exact same order as each card in the second deck. The audience really goes wild for that one. People seriously go bananas – they have heart palpitations. They can’t sleep that night. And I’m jumping up and down like Willy Wonka. It’s funny you mention Willy Wonka. You remind me of him — Gene Wilder’s version, at least. The character of Willy Wonka has been a role model for me. I like his transition from mysterious man to crazed maniac – peeling away layers and seeing more and more about this nutty guy. Did he inspire your three-piece suit, too? In London, I saw Prince William wearing this exact outfit – a morning coat, a vest with a little lapel, and striped trousers. So I went to the store where the princes shop, and bought that exact outfit. I think it’s so appropriate in this environment. Cohen uses as few props as possible in his shows; he believes they create barriers and cheapen the experience. The kettle is an exception. Best part of your job: Immediate feedback. I can tell by looking at audience members’ eyes whether I have them under my thumb. When people’s eyes are glowing, I know I’ve done my job. I’ve learned what captures people’s imaginations. Most challenging part of your job: Nobody else in the world is doing this type of performance, so I don’t have a support team. I’ve lost the camaraderie of fellow magicians; a lot of them are jealous. Resources for new material: The Conjuring Arts Research Center in New York has a database with every secret that has ever been published in magic, from the 1500s to present-day. You have to be a member or have special access. Any pre-show traditions? David Copperfield once told me that he brushes his teeth with a certain toothbrush before every show. I joke around and say that I floss before every show. But the fact is, no. I’m very relaxed. Everything in my show is meticulously planned. Without fail, I know the precise minute that I’ll be saying a certain line. The last time you got nervous: When Woody Allen came in and sat in the front row. I had cotton balls in my mouth, but he was the greatest audience. He laughed at all the right times. On the Late Show with David Letterman, Steve Cohen performed his favorite trick, involving a lemon, an egg, a walnut, and a ring. What would people be surprised to learn about your job? You can buy and sell secrets. I once licensed a trick from another magician for my show, but after the terms of the legal contract expired, he wanted the trick back. So I had to create my own version of the trick. Your most expensive trick: I spent $10,000 for a trick that only lasts two or three minutes, but it’s a really good trick. I fill a flower vase with all different flowers and cover them with a handkerchief. Then, I ask an audience member to name her favorite flower. Say she responds with yellow tulip. I take the handkerchief away, and all the flowers have transformed into yellow tulips. How do you deal with uncooperative audience members? People have predispositions toward magic shows. Those who give me problems – maybe they got embarrassed at a magic show when they were little. I handle them the same way I would handle kids, and try to diffuse the challenge by making my show lively and interactive. One weekend, Warren Buffet paid Cohen to cancel all his shows and fly to Omaha (pictured above). 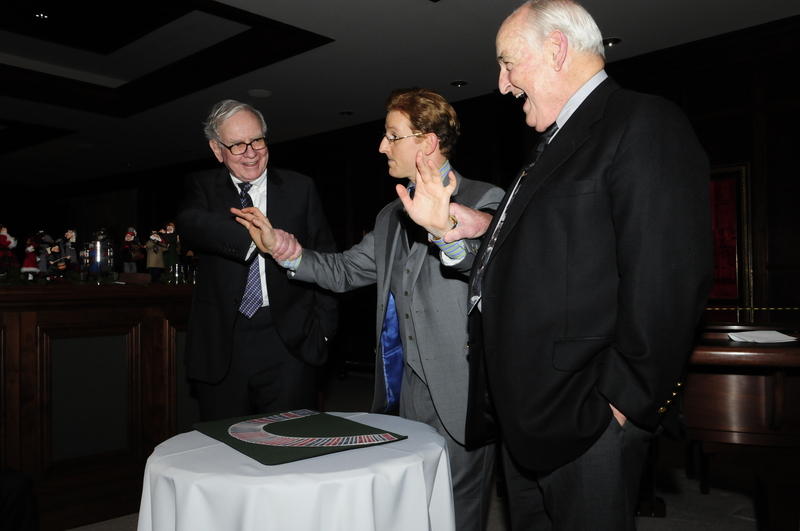 Your website boasts some of your more famous clients, like Warren Buffet. I still get people coming in here all the time, like, Warren sent me. I always carry with me a card that he signed. Physical parameters of your show: I need to be inside of a room with no other distractions. People must be completely riveted on just me. I can’t have people thinking about what they’re going to make for dinner. Your required reading: Influence: The Psychology of Persuasion by Robert Cialdini. It’s about how and why to persuade people to see things your way. You never leave home without: My deck of cards. I rarely do magic outside of a venue, but it makes me feel good that I could, if I needed to. Have you ever pulled a rabbit out of a hat? Yes, and it’s wonderful. I don’t do it regularly, though, because then you have to keep a rabbit as a pet. Find a venue that is appropriate to your vision of magic, and become the person best suited for that venue. If you’re really good at performing at Bar Mitzvah parties, for example, become the very best Bar Mitzvah magician out there, and work tons of them. Tickets for Chamber Magic range from $75 to $100; priced separately for private company events. Follow Steve on Twitter and on his Facebook page. All photos courtesy of Steve Cohen. This entry was posted in Best Of, Big shots, Cool jobs and tagged chamber magic, magic shows, magic shows las vegas, magic tricks, steve cohen magician by Megan Hess. Bookmark the permalink.